JOIN THE SPOOKTACULAR CREW! Click here to join the Spooktacular Crew Group at Facebook. Share your ideas, comments, your creative endeavors (writing, podcast, artwork & more) and hang out with some of the creepiest yet fun people! Come be spooky with us! BECOME A PATRON AND SUPPORT THE SHOW! We are completely listener supported. You become our Executive Producer when you sign-up! For as little as $1 a month, you can start being a part of one of the best reward programs out there with a secret Facebook group, bonus content every week, exclusive videos and logo gear! 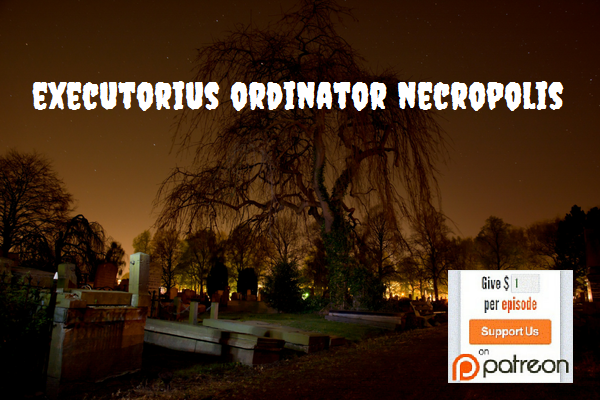 Plus, you get a burial plot in the Executorius Ordinator Necropolis! GET THE GEAR! 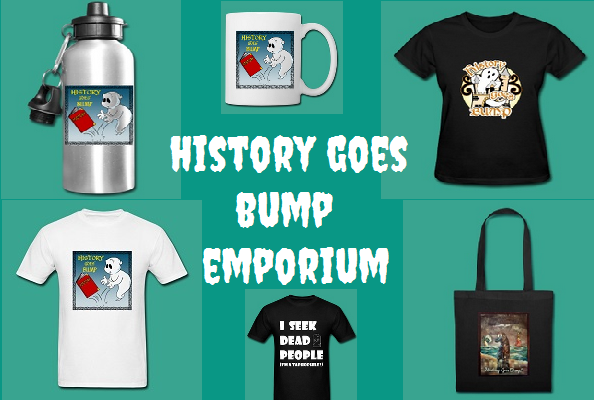 The History Goes Bump Emporium has all your HGB logo gear and accessories! Mugs, Totes, shirts and all with a variety of designs! Every purchase helps support the show! Posted on November 29, 2018 by History Goes Bump Posted in Haunted Location	. Old jails just seem to be crawling with spirits as we have come to find from the several jails covered on this podcast. No matter the country, region or city and no matter the size, prisons hold spirits. One incredibly haunted jail can be found in Iowa. Council Bluffs was known as the Great Railroad Center of the Northwest. Before that time, it was a hub for trade between Native American tribes and white settlers. The Squirrel Cage Jail was built here in 1885. This jail has one of the most unique designs of any jail I have ever researched. This prison had a long run, being used until 1969. Today, it offers tours giving a glimpse into penal history and is said to be home to several spirits. Join me as I explore the history and hauntings of the Squirrel Cage Jail. The Moment in Oddity features Old Mike and This Month in History features Architect Stanford White Born. Our location was suggested by Jessica Garcia and Lynne Larsen Savage. Tags: ghosts, Haunted Iowa, history, Squirrel Cage Jail, travel	. Posted on November 15, 2018 by History Goes Bump Posted in Haunted Location	. Visiting the Great Wall of China is a bucket list item for many people. This man-made structure runs west to east across northern China for 13,171 miles. Construction began with the First Emperor of China over two thousand years ago. Building would continue for centuries with most of the work being done during the Ming Dynasty and actually, most of the original wall no longer exists. Thousands of people died while building the Wall and many died in battles near and on the Wall. This much death seems to have lead to paranormal activity. The Wall is said to be the most haunted structure in China. There are many ghosts seen here. Join me as I explore the history and hauntings of the Great Wall of China! Moment in Oddity was suggested by Pat Clifford and features Sarah’s Grave and This Month in History was suggested by Johnny Marvin Allen and features the murder of Stringbean Akeman. Our location was suggested by Katrina Ray-Saulis. Tags: ghosts, Great Wall of China, Haunted China, history, travel	. Posted on November 8, 2018 by History Goes Bump Posted in Haunted Location	. Vicksburg is one of those Civil War era cities that I long to visit because I love antebellum mansions. The Greek Revival architecture and magnolia trees take me back to an earlier time with hoop skirts embellished with ribbons and elegant carriages riding in the streets, but it was also a dark time of slavery and division in the United States that would lead to the outbreak of the Civil War. Vicksburg was the scene of an intense battle that would leave over 37,000 causalities in its wake. Just prior to the outbreak of the war, Duff Green built his mansion and the Bed and Breakfast still carries his name today. The mansion seems to have more than just the Green name. Spirits of the family members seem to have stayed on her in the afterlife. Join me as I explore the history and hauntings of the Duff Green Mansion! The Moment in Oddity was suggested by Kim Gasiorowski and features the Park of Monsters and This Month in History features the founding of Mission San Juan Capistrano. Mort starts his Executive Producer eulogies on this episode as well! Tags: Civil War, Duff Green Mansion, ghosts, Haunted Mississippi, history, travel	. Posted on October 31, 2018 by History Goes Bump Posted in Special	. The annual HGB Halloween Special is here featuring paranormal experiences by fellow listeners. We have many spine-tingling tales that will cause the casual skeptic to take notice. And since this is a history podcast, you just know we needed to add in a little bit of that. So we talk about the history of haunted house attractions. I’m joined on this episode by our Spooktacular Crew Admin, Kelly! Tags: ghost stories, ghosts, Halloween, real paranormal experiences	. Posted on October 25, 2018 by History Goes Bump Posted in Urban Legend	. Roadside apparitions have been witnessed by thousands of motorists and there seems to be a legend of a hitchhiking ghost in every state in America. Many countries around the world have these hitchhiking ghost tales as well. These tales are haunting and tragic. They usually involve a young woman standing on the side of the road, appearing to be in distress or in need of a ride and after being noticed or picked up in a vehicle, she disappears. There is a level of trust and intimacy in giving someone a ride in your car, particularly a stranger. In our modern era, it just isn’t save to be either the driver or the hitchhiker. And maybe that is why these types of tales are so prevalent. There already is a basic level of fear involved in the act of hitchhiking. This episode can’t possibly cover every single legend out there involving hitchhiking ghosts, but we will touch on several that include tales from across America and from several countries. Join me on the roadside as we search out the legend of the hitchhiking ghost. Moment in Oddity features Pumpkin Races and This Month in History features the calliope is patented. Tags: history, Hitchhiking Ghost, legends, Paranormal, Resurrection Mary, urban legends	. Posted on October 18, 2018 by History Goes Bump Posted in Haunted Location	. The site where the Ferry Plantation House stands in Virginia Beach was once the scene of a trial for a woman accused of practicing witchcraft. That woman was Grace Sherwood and it would be her neighbors that claimed she was a witch who had bewitched their land and animals. She underwent the test of ducking to see if she was, indeed, a witch. Over the years, several houses stood on the site, falling victim to fires. The most recent house is a great example of Federal architecture and features a glimpse of Colonial life. This home also features ghostly activity produced by reputedly many apparitions. The Ferry Farm is said to be one of the most haunted locations in Virginia. Listener Whitney Zahar joins me to discuss the life of Grace Sherwood and the history and haunts of the Ferry Plantation House! Moment in Oddity features a flaming hole opening up in Arkansas and This Month in History features the death of William H. Eddy. Tags: Ferry Plantation House, ghosts, Grace Sherwood, Haunted Virginia, history, travel	. Posted on October 4, 2018 by History Goes Bump Posted in Haunted Location	. The Iron Island Museum is said to be the perfect spooky spot for anyone in western New York to enjoy a little Halloween fun. For those of us who celebrate Halloween year round, this museum is the perfect spot for a ghostly encounter. The tales of experiences are numerous and this location has been featured in multiple paranormal television shows. The museum showcases the charming and proud history of the Lovejoy neighborhood in Buffalo. The memorabilia is a sight to see and the place is crammed so full, it takes several hours to enjoy it all. And perhaps this is why the place is so haunted, all that memorabilia. Or could it be the former use for the building causing the hauntings? Join me as I explore the history and hauntings of the Iron Island Museum. The Moment in Oddity features The Koreshan State Historic Site and This Month in History features the first double-decked steamboat arriving in New Orleans. Tags: ghosts, Haunted New York, history, Iron Island Museum, Paranormal, travel	.